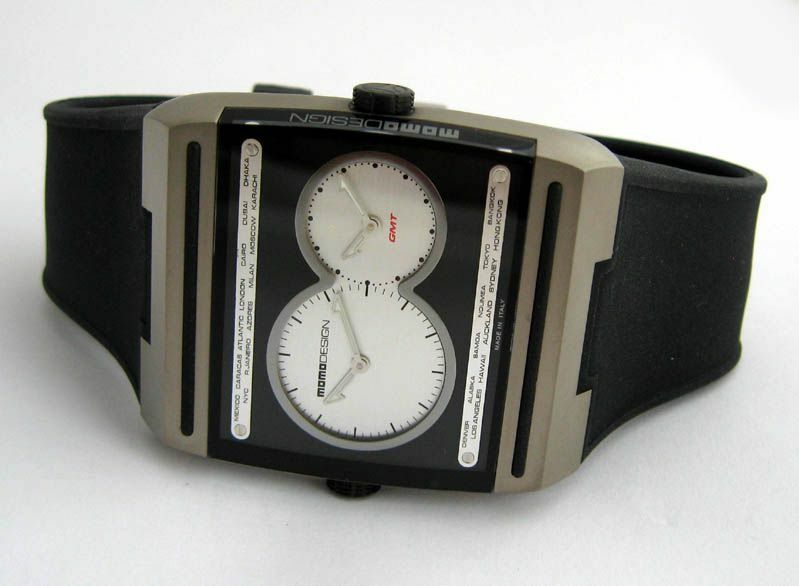 Momo Design One Time Evolution Black Dial. Momo Design One Time Evolution. 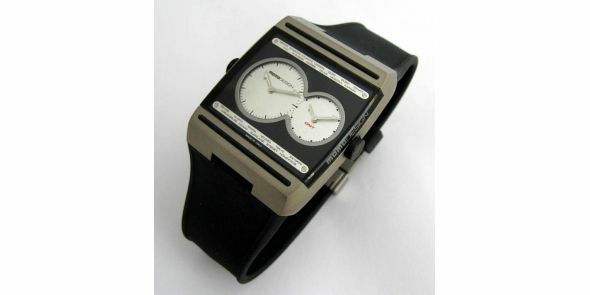 This is a handsome and stylish looking wristwatch. The case shows modern style focusing on design whilst the dial is very retro and Bauhaus looking in its design giving the perfect combination of vintage and modern in the same watch. The case is made of titanium so is durable yet light in weight. The crystal is thick and exposed at the case sides and is laser etched with the Momo Design logo on the right hand side of the crystal. This is a subtle logo and not too noticeable, but highly visible in certain lights. 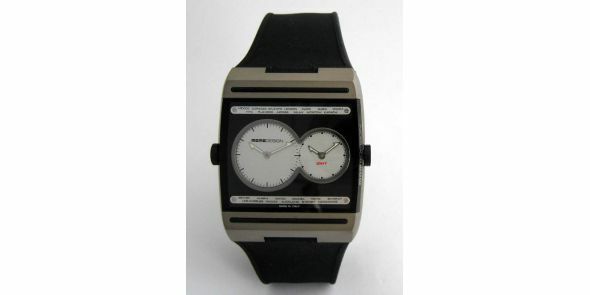 It has got a beautiful black and silver dial with the silver clock faces cut into the black square, making for an altogether very nice looking watch. 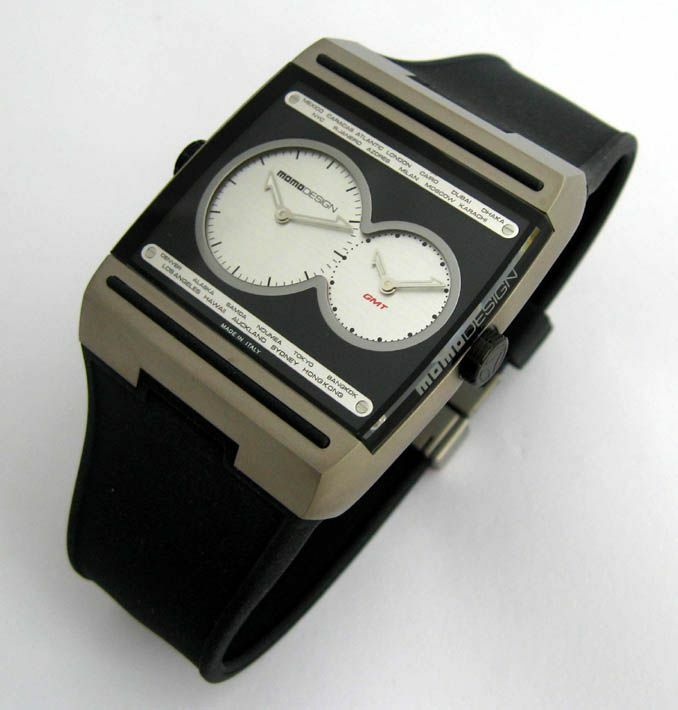 It has got two clock faces which are independently operated by a crown on either side of the case. The panels above and below the faces show the major time zone cities across the world. It has got a hardened mineral crystal and is water resistant to 3 ATM which is approximately 30 metres. It has black titanium crowns. It comes on a black rubber strap with titanium butterfly folding clasp which is signed. 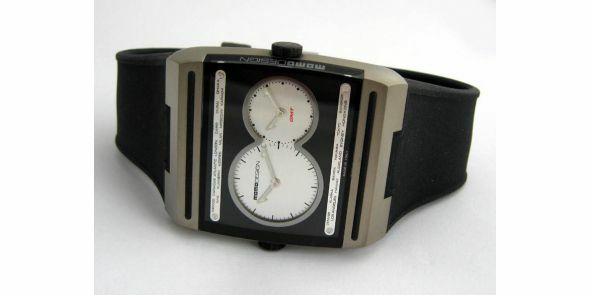 The watch is brand new with factory warranty with box and papers. 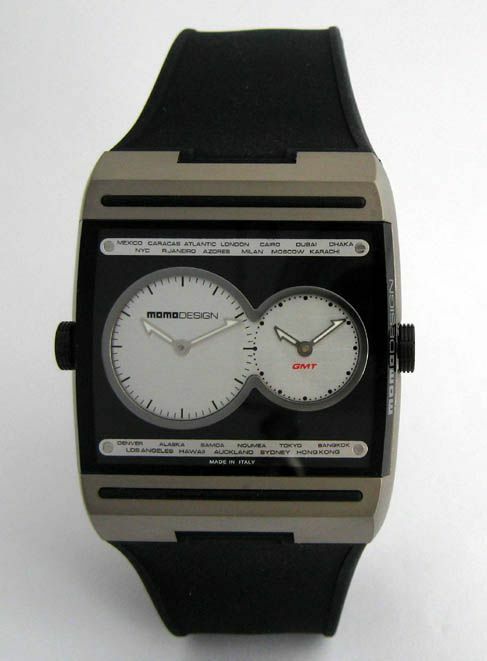 Momo Design reference number MD1077-02BSSS-RB. Dimensions are: width is 40 mm excluding crown, 44 mm including crown, lug to lug is 48 mm and thickness is 9 mm. MMD 20.